Although the trail had snow and ice on many of the sections, we had a beautiful, warm day on March 30 along the 8.8 mile hike from Reeds Gap north on the AT to Cedar Cliffs Overlook. Thirteen hikers joined hike leader, Marit Gay, including Iva Gillet, Tricia Neumann, Dave Borsach, Marian Styles, Bev & Pete Fink, Brad Young, John Shannon, John Brandt, Rich Bard, Michael Seth, Barbara Martin, and Mark Trail. Clai Lange met us later in the day for the slide show at Wintergreen. RIGHT: Snack time on rocks viewing the Shenandoah Valley - Michael, Iva and John B. LEFT: Mark and Barbara have lunch with the group on Cedar Cliffs Overlook. From the half way point at lunch a small group journeyed back to the cars via the Blue Ridge Parkway and the others walked the trail along the side of the ridge back to the starting point. After the hike the group enjoyed refreshments and a slide show about Marit's Pacific Crest Trail trek at her Wintergreen home. We ended the day celebrating Iva's birthday! RIGHT: Pete and Bev relaxing. LEFT: Michael and Tricia (bunny for the day). After the March snowfall that brought down many trees and limbs in central Virginia, I wondered how many trees had fallen or broken along the Appalachian Trail, so with Skyline Drive open, I decided to do my third post-storm inspection with light clearing trip in the last 12 months. Pete Fink generously ferried me from Rockfish to McCormick Gap. 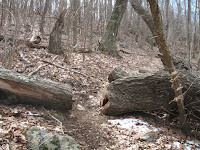 Pete’s prediction of little damage on this section of trail proved correct. 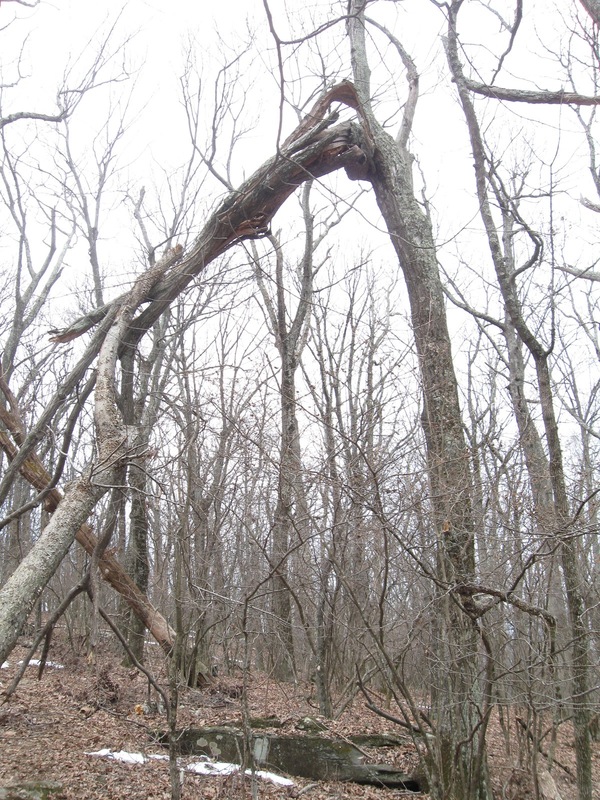 I found a few small branches, then a broken treetop hanging over the trail with a dead tree leaning against it. I cut some small branches off to tidy the area and make it easier to walk through. Until the large branches fall to ground, we cannot remove them from the trail. The other tree on the trail was one I started cutting last fall. 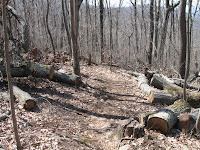 As expected, after completing the cut, I could not move the tree off the trail. I spent some time what some might call manicuring the trail by removing little branches that will soon grow into the trail. 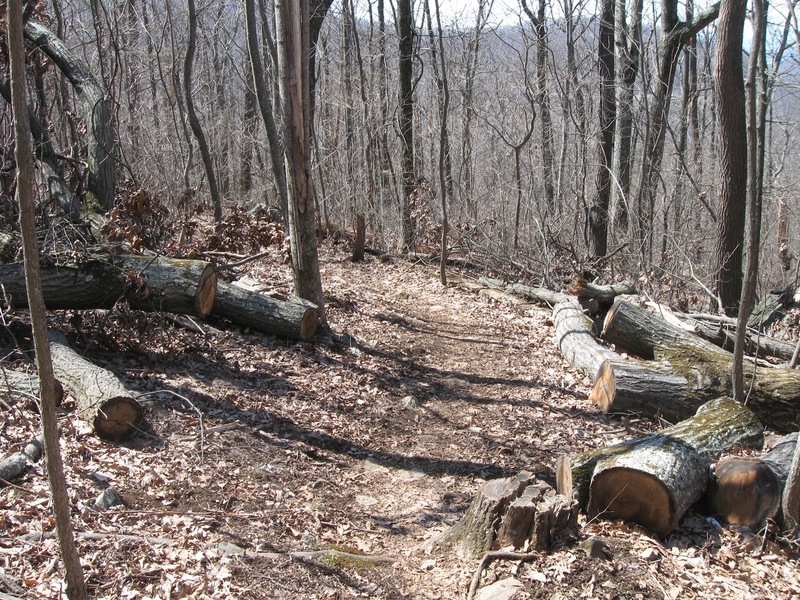 Closer to McCormick Gap, to improve the appearance of the trail, I cut some small branches on some of the trees which which we removed from the trail after last summer’s derecho. The standard trail maintainer’s Christmas present of large loppers helped with this task. Seeing all the fallen trees that had been previously cleared by Don Davis and Andy Willgruber after the derecho makes one appreciate just how much work the two chainsaw experts did. I also noted some areas where treadwork is desirable to slow future erosion—work that needs dryer weather and a McLeod to accomplish. Lastly, in preparation for spring, I thinned garlic mustard and bittersweet in a couple of spots. The big one from 2012 Derecho. To help the trails manager of the Vining Tract, Iva Gillet scheduled a hike with possible clearing at the Vining Tract near Lydia. On an overcast morning, Marian Styles, Martin Volaric, and I left from Albemarle High and met up in Lydia with Iva, Michael Seth, Paige Madison (visiting from Texas), Marit Gay, and “Mark Trail,” another Pacific Crest Trail hiker. The hikers walked up to Mutton Top Cabin before continuing on to other trails. One trail took us to an excellent overlook, while and another took us along side Mattie’s Run. Some of the trails consisted of old logging roads and were very steep. During the hike we cut some small blowdowns and some vegetation on the trails, and we noted trees warranting a chainsaw. I used a McLeod to start some water runoffs in places, but in others, erosion control will require a major effort. On some trails, relocating a trail may be a better option. Back at Mutton Top, Bill Holman, cabins supervisor Mel Merritt, Dan Ralston and Geoff Manning-Smith cleared vegetation from a wall. During our hike the forecast rain was light and short lived, so we did not get very wet. We got back to the cabin at 3 p.m., just in time to watch a heavy shower from inside the spacious cabin while we enjoyed snacks and drinks. Afterwards, some of us headed home, and some stayed the night at the cabin. We have a discovered a new law of nature, namely that scheduling the Big Run loop hike results in a weather event closing Shenandoah National Park. Today leader Ken Moss set a record for the most cancelled hike, which he may schedule in July or August when we might welcome some cold weather. Today he combined his interest in railroad and trails by proposing a hike along a former railroad track crossing the Piney and Tye Rivers. Our starting point was at Rose’s Mill off route 56, best known as the road leading to Crabtree Falls. This trail has been built by local volunteers and featured a portable toilet, which was needed because there are houses at the trailhead. After 8 inches of snow in Charlottesville the previous Wednesday, and snow covered mountains visible on our way south, we found pleasant temperatures. We set off along the relatively flat surface, seeing a few remnants of the railroad, and crossing the rivers. By late morning we passed under route 29 and found an old weighing station at the former Tye River Depot. Then across the river we heard and saw a current train, with the unusual sight of one locomotive in a heritage paint scheme from one of the railroads that became part of today’s Norfolk Southern railroad. It was so warm, some avoided the sun and rolled up pant legs. Then we headed back, uphill, twenty feet of climb. With the smooth, nearly flat surface, and the group we had, we completed a little over 10 miles by 2 p.m., time for one person to get to an afternoon movie. Snow and ice have changed 4 hikes this year, so I was determined to choose a hike that would be hard to stop, and chose Furnace Mountain from the park boundary. Instead of snow covered Skyline Drive disrupting our plans, we had snow fall on us at the trailhead. However it was light, and the climb kept us warm. One of our group was from Richmond, where the flat land left him unprepared for the mountain part of Furnace Mountain Trail, but Howard Davis and John Brandt stayed with him, and made sporadic radio contact with me by two way radios, which we found cannot be relied on. More reliable communication was John Brandt loping up and down the trail between the two parts of the group. Most of us went out to the summit and its magnificent overlook of Madison Run. I had mentioned an option of walking further (something missed by some when they saw “less than 5 miles”, but most, perhaps all, were happy to turn around to get out of the cold. Fourteen humans and one dog were happy to have today’s short walk up a mountain and see the Shenandoah Valley.